The Hup M 28-22 has a 91.8 ft. (28 m) jib and features 16 configurations, which is unique to this category of self-erecting cranes, enabling it to be easily adapted for a range of job site applications. The crane has a maximum capacity of 2.4 ton (2.2 t) and can lift 1,874 lbs. (850 kg) at its 92 ft. (28 m) jib end. 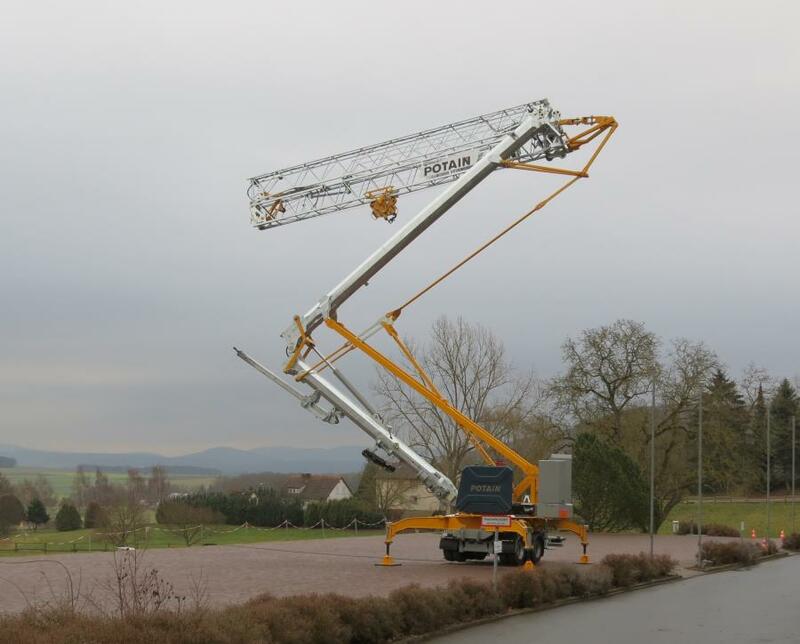 Potain's first mobile Hup self-erecting crane, the Hup M 28-22, is the third model from the Hup self-erecting crane range but the first to prioritize mobility. The new design of the Hup M 28-22 provides best in class compactness.The model is only 38 ft. (11.5 m) long when folded, enabling work in narrow, restricted job sites, as well as making it easy to transport from site to site. The Hup M 28-22 also features advanced transport equipment with double steering axles. "The new Hup M 28-22 optimizes mobility, productivity and versatility for our customers," said Jean-Pierre Zaffiro, global product director of Potain self-erecting cranes at Manitowoc. "This combination will increase return on investment for many lifters." Versatility is delivered with the crane's raised jib that offers four positions: horizontal, 10 degrees, 20 degrees and even 30 degrees. These functions give the crane a height under hook range between 65 and 101 ft. (20 and 31 m). Folding or extending the jib is a swift and straightforward operation, with the Hup M 28-22 offering convenient configurations for both short and long jib lengths. Operator productivity on the Hup M 28-22 is maximized through Manitowoc's remote control unit. The remote system features a large, colored screen with easy to use navigation and optimized ergonomics for operator comfort. Its Smart Set Up software delivers on-screen, information on automatic folding and unfolding of the crane from the crane's remote. Like the other Hup models in the range, this new model also benefits from Manitowoc's drive control functionality: three selectable profiles for operators that vary the working speed of the crane to suit the application. On the top of that, the micro-speed function delivers slow and high precision hoisting. For more information, visit www.manitowoc.com­.